When a prospective student visits Rocky Mountain College, their first thought is not, “I wonder if this is a tobacco friendly school.” One assumes that RMC is tobacco-free because… well, it is 2016. When I found out that RMC was not a tobacco-free campus, I was appalled. Although I have no judgment on those who choose to smoke, it makes my heart ache to think I chose a school that has no regard to the students who have lost loved ones due to second-hand smoke, and would be okay with passing on those “chances” to their students. That is when I decided to work with the Tobacco-Free RMC Task Force. Now let’s refute the argument that a college environment means “growing up and making your own decisions, and not having someone dictate them.” First, Tobacco-Free RMC only wants users to stop smoking on our beautiful campus. You are free to smoke anywhere else that is appropriate. Also, what about the people who have to walk through others’ smoke? What about the people who are too shy or afraid to approach an upper classman or even a professor and ask if they can move elsewhere? 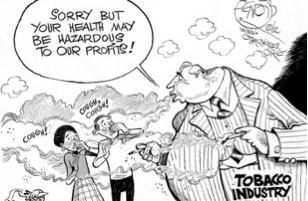 In that moment, their choice for clean air is compromised by another’s choice to smoke. Tobacco Free RMC not only wants to help tobacco smokers, but also tobacco chewers. It is the tobacco user’s choice to decide if they want help or not. Although there are numerous harmful effects for both chewing and smoking, ultimately to stop altogether is up to the user. Becoming a Tobacco-Free campus will help the temptation for those who do decide they want to quit. There is a false assumption that tobacco users are not welcome at RMC. Much like a loved one would want a tobacco user to quit smoking, Tobacco-Free RMC wants to transition to this tobacco-free policy because they LOVE the RMC students. They want to see their students live long, healthy lives. Judging a person on their choice to smoke is not the goal of this policy. Providing a healthy environment to RMC students is the goal. With this new policy, Tobacco-Free can provide quit kits and any other resources that might be needed. RMC should have this policy if they love their students. I believe it is wrong that RMC has gone this long without a policy. RMC promotes a healthy lifestyle (changes to the cafeteria food and also their new focus on the exercise programs), yet tobacco use (which mentioned before is proven to be unhealthy) is being tip-toed around because of the threat of displeasing its faculty, and worse, RMC’s paying students. Without this policy, RMC shows that all this institution cares about is money. I find it similar to what we all know of as “BIG TOBACCO.” I hope I am wrong, and if so, then this is the only direction RMC can be heading. Instead of trying to fight it, help. Help Tobacco Free RMC understand the needs of tobacco users. Do they need more resources readily available on campus? Do they need a Q & A? What are we missing? We ask because we love you. We ask because you ARE welcomed! Again, we welcome your feedback. If you have any questions or concerns please direct them to tobaccofree@rocky.edu. This entry was posted in Uncategorized and tagged alicia bravo, Chew, Cigarette, Tobacco, Tobacco-Free RMC. Bookmark the permalink.